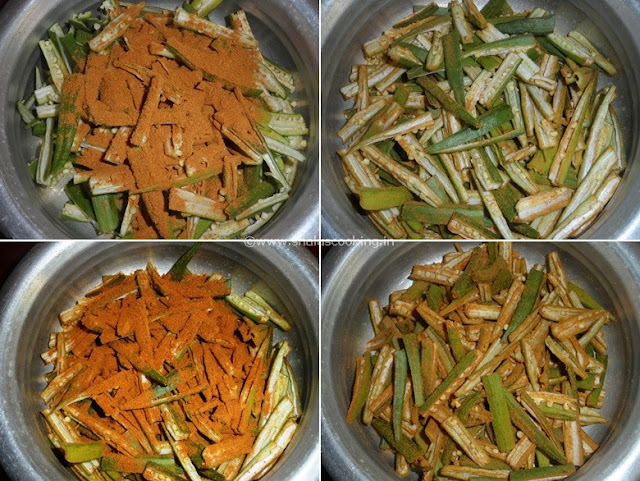 Bhindi Dry Fry - Lady's Finger Dry Fry, this is one of the easy method for frying Bhindi. Though the method of preparation is simple, we need little patience to fry it. Yes, we have to fry the bhindi in low flame till it is nicely fried. We are not going to deep fry the bhindi, so it does not need much oil to fry, just few spoons of oil will do. Click Here to know how to clean and cut the lady's finger / bhindi. Lady's Finger / Bhindi - 250 gm. Amchur Powder - 1/4 tsp. a. Clean and cut the lady's finger into finger length pieces. b. Take a dry bowl and add all the masala powders and salt. Mix it well. 2. Sprinkle the Mixed masala powders over the lady's finger in parts. First add half of the powder and toss well. Once it is evenly mixed, add the remaining masala mix and toss it well to get evenly coated with masala. Set this Bhindi Mix aside for about half an hour. 4. After some time, the bhindi will become sticky. So keep stirring often to avoid sticking to the pan. After about 20 to 30 minutes, all stickiness would go and the bhindi will become dry and fried well. Switch off the flame. Tasty Bhindi Dry Fry is ready to serve. Serve it as an accompaniment with any variety rice. Tastes best with Curd Rice. Rich in Fiber, which helps in digestion.